Swim Meets are the backbone of any summer swimming season. They are a chance for swimmers of virtually all abilities to display the skills and strokes they refine all season in practices. They are a fun and relatively relaxed opportunity to compete against other children of the same age and abilities. There are a number of different swim meets and swim meet formats that different clubs across BC feature throughout the Summer Swimming Season. A/B Swim Meet – This is the most common form of swim meet in Summer Swimming. 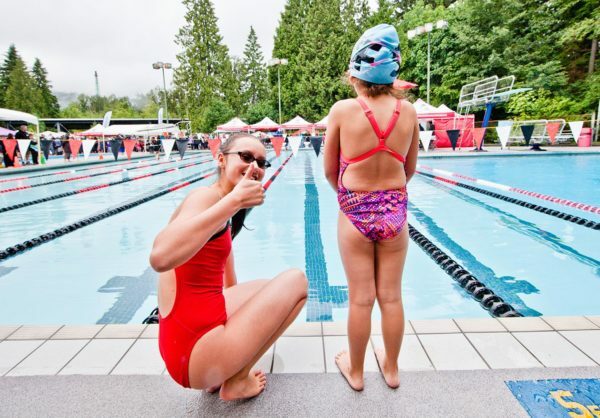 The Port Moody Aquarians will attend A/B swim meets in Coquitlam, Burnaby, Port Coquitlam, several out of regions meets, as well as hosting our own A/B Meet. These meets take place on Saturday and Sunday and they run from early morning to mid/late afternoon. 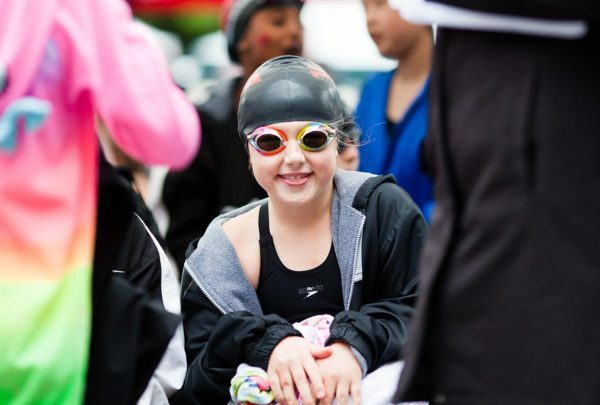 Swimmers at these meets range from 5 to about 20 years old and are separated into Divisions by age (Division 1 = youngest to Division 8 = oldest).Swimmers of many different ability levels are encouraged to participate in these meets, including new swimmers. However, the ability to swim at least 2 lengths of at least 2 of the strokes is often a good guideline for those who are interested in competing. Development Meet – Development Meets are geared towards the new and younger swimmers. There are a few of these meets throughout the season. The Aquarians will be attending development meets for clubs within our region. These meets are often held during the evening on a Friday or Wednesday night. They are open to those swimmers who do not yet have the ability to swim 2 lengths of the pool, those who are new to competing and those who do not have the skills in all the strokes. Events include 25-Meter Races of all 4 strokes, as well as the option of doing 50-Meter races of their better strokes. Regional Championships – Every year, towards the end of the swimming season. The 5 clubs of our region (PMA, Port Coquitlam, Coquitlam, Burnaby and Burnaby Mountain) compete in the Regional Championships. This serves as the qualifying meet for the Provincial Championships, as well as the final meet of the season for those that do not qualify for Provincials. This meet is run as an A/B Meet, meaning that there are no 25-Meter events. The top three swimmers in each individual event, and top two teams in relay events qualify for the Provincial championships in late August.Swimmers must have legally completed a race (no DQ) in at least one stroke during the season are able to attend this meet. At the coaches discretion, swimmers who have only competed in a 25m event may be entered in a 50m event at Regionals.Development swimmers are eligible to attend this meet. It is not uncommon for PMA to have a Div 1 relay team which includes Development swimmers qualify for Provincials, so we try to get any who have improved enough during the season to attend this meet. Provincial Championships – At the very end of the season there is the Provincial Championships meet. This meet features Summer Swimmers from around the Province who have qualified for the meet within their individual regions. This meet is 3 days instead of the usual two, to account for the larger amount of swimmers. It is held at different venues through BC every year. At the beginning of the season, we run a mini-swim meet for only our club. After their race, the swimmers must go and see their coaches for a quick debrief and then you can shower them with praise over their outstanding efforts! How do I sign up for Swim Meets? Meet sign up starts from the Meets & Results Page where information is available about each meet. There is a link to the Meet Entry page for each meet which is open. My child doesn't swim very well. Why would they want to compete? Swim meets are fun, great exercise, and help build confidence! The swimmers get to race, cheer their teammates on, and play games in between events. 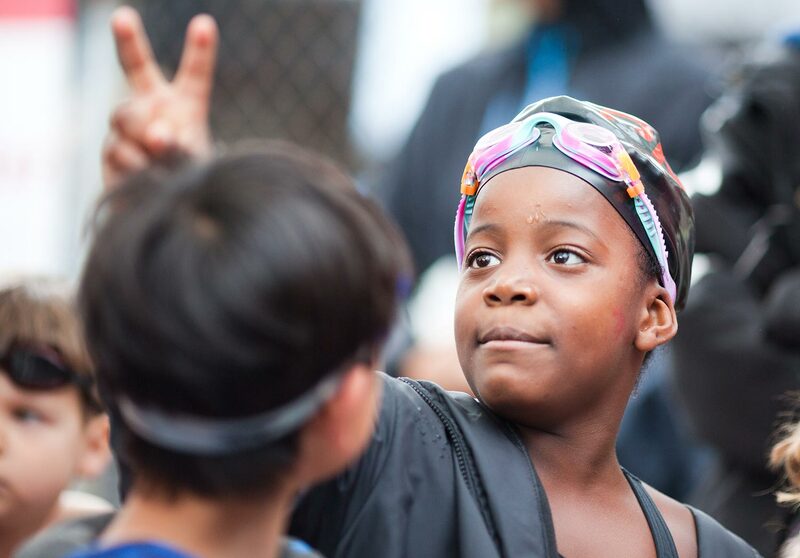 Children are grouped with other swimmers who are of similar ability, which allows for a positive swim experience. Competitions allow swimmers to achieve their personal bests and measure how much they have improved. We encourage swimmers to compare to their last best time rather than to other swimmers. Do I have to attend both days of a swim meet? It is highly encouraged for swimmers to attend both days of a swim meet. Even though they compete individually, it is at the swim meets where we come together as a Team – hanging out playing games between races and cheering each other on. The coaches also want to ensure swimmers have the opportunity to race each of the strokes throughout the season – which is more difficult to do when only attending one day. If you have conflicts which prevent you from attending both days or a full day, discuss with your coach about attending only one day or other options that may be available. What strokes do swimmers compete in? Front crawl (freestyle), backstroke, breaststroke, butterfly, and individual medley (all 4 strokes). There are also team relays for freestyle and medley. What do I need to bring to a swim meet? Keep in mind that swim meets run rain or shine so be prepared. We have large PMA tents but many families also bring along small pop-up tents. If you have a truck or large Crossover/SUV/Van, we are always in need of volunteers to bring the club tents to the meets. Are parents expected to volunteer? Yes. 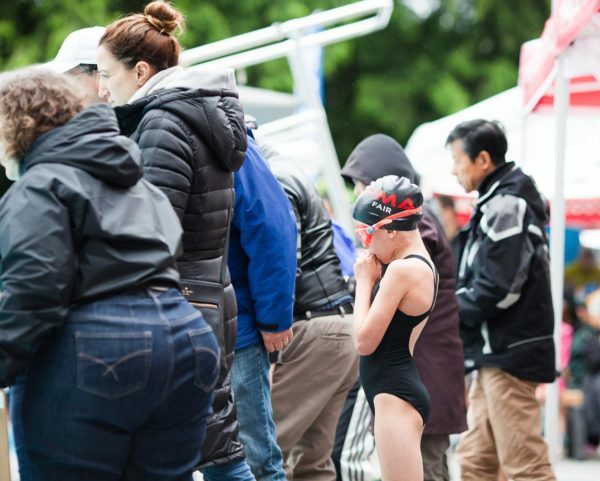 Swim meets are run by parents so each parent is expected to sign up for a volunteer shift at the swim meets your child is competing in. You are there anyway so you may as well help out. The volunteer shifts are usually short (2 hours or so). If you have further questions about this, please ask. At our home meet at the end of June/early July, the volunteer help needed is much greater than at any other meet all season. We will be asking all parents to come and help out – even if your child will not be competing. Shifts will be assigned if there are not enough people signing up ahead of time. Why go to swim meet warm ups? At every swim meet PMA is designated a lane or two at specific times to warm up in. The warm up times are usually between 6:15 and 7:30 am each morning of the meet. Each group of swimmers will be assigned a time to warm up and those times will be emailed to swimmers signed up for the meet. The most important reason to attend warm ups it that no two pools are set up the same way. They may seem to look alike, but there are many differences. The starting blocks will be different. Some will be higher than others, some will have less traction than others and some may not allow a swimmer to place their hands in the same position as other blocks. The walls of the pool will be different as well. A common complaint is “the walls are slippery”. The clarity of the water also seems to change from pool to pool. Children often come out of the pool and claim that they couldn’t see the walls very well. The backstroke flags at each pool have the potential to be different. The swimmers will not be aware of any of those things that have the potential to change their races dramatically if they do not get in their warm ups. Warm ups are used more for familiarizing yourself with the pool than actually preparing your muscles for the race. This is also when the coaches take a head count, start preparing for relays as well as have a few minutes to talk to each of them before the racing starts. They are also required to scratch no-shows during warm ups to make room for deck entries into those heats. We don’t plan the warm up times to be so early to be mean. It is in the best interest of your swimmer(s) to make it to the warm ups at each meet. It will only help their swims. How do I Use Hy-Tek Team Stats Online? There may be more than one page of any letter and you may have to use the “Go to page” dropdown at the far right. Choose the event and a the rankings will appear. You may have to scroll through pages using the “Go to page” drop down menu on the far right. What division do I swim in? The division you compete in is based on your age at the start of the season. You can look these up in the BCSSA Swimming Age Locator available from the BCSSA each year.